On January 21st 2018 the Sunday Times ran a scaremongering story claiming that Jeremy Corbyn's renationalisation plans would be a "£176 billion gamble". On further investigation the Centre for Policy Studies report that this "£176 billion gamble" headline is derived from was written by a former adviser to the Tory MP Amber Rudd and the unelected Tory lord Nigel Lawson called Daniel Mahoney. The Sunday Times conveniently forget to mention that the author of the report they've churnalised into an anti-Corbyn hatchet job is an outright Tory! 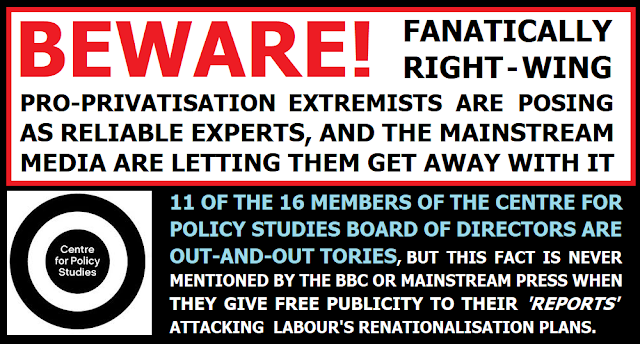 Aside from uncritical appraisals of his "report" in numerous right-wing newspapers, Mahoney was also invited onto the BBC to opine about why the Carillion collapse isn't a demonstration of the failure of the hard-right privatisation and outsourcing agenda, without them even bothering to explain that he's a Tory. Neither did they identify his Tory party links when they quoted his objections to Labour's plan to bring hospital cleaning services back into public hands. Then there's the fact that the Sunday Times article tried to dress the Centre For Policy Studies up as some kind of neutral and impartial "think tank" when in fact they're undeniably a shady hard-right pressure group that is completely riddled with Tory politicians and Tory party donors (see image). 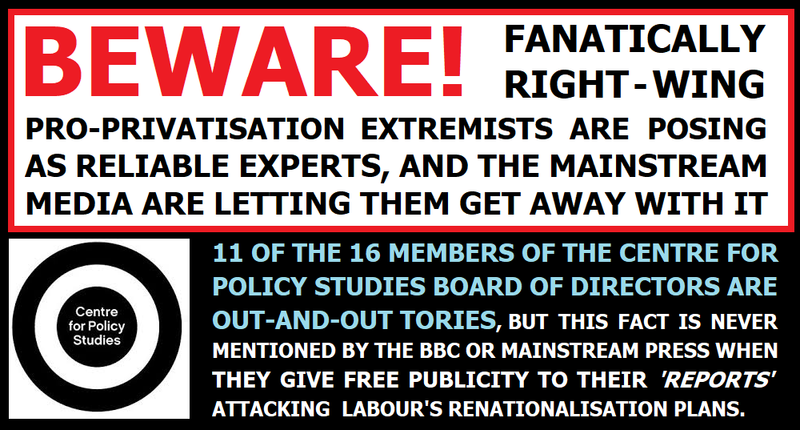 Far from being the kind of organisation to be quoted extensively by the BBC and the mainstream press as if they're a reliable and impartial research organisation, this is a hard-right pressure group that reads like a who's who of the pro-privatisation lobby. The 16 person board of directors includes eleven out-and-out Tories. The other five include a fanatically right-wing academic, the chairman of HSBC bank, the editor of the hard-right Spectator magazine, the wife of the Daily Mail owner, and the chairman of the Times Newspaper Group. It's interesting that the Sunday Times omitted the fact that the Centre for Policy Studies is a hard-right pro-Tory, pro-privatisation pressure group. Given that their chairman is actually a member of it, it's hardly likely that they didn't know exactly what it was when they decided to churnalise it's "report" into headlines. 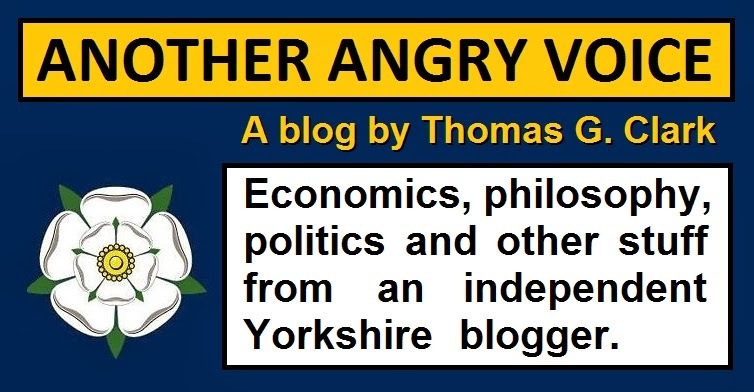 Aside from being absolutely riddled with out-and-out Tories and representatives of the right-wing press, the Centre For Policy Studies has also been given the lowest possible ranking for opacity by Who Funds You? because they release no information whatever about where any of their donations come from. 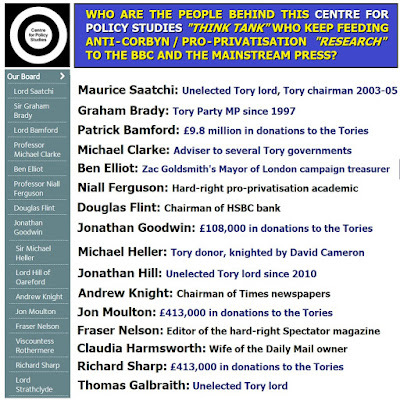 So the next time you see a newspaper citing the Centre for Political Studies, remember that they're an incredibly shady hard-right pro-privatisation propaganda unit staffed almost entirely by Tories and people with links to the hard-right press.